We’d love your help. Let us know what’s wrong with this preview of CRACK by D.E. McCluskey. Joe O'Hara is having a bad morning, and it's just about to get worse. A random road traffic accident sends him on the path to addiction. Crack is the only thing that can give him any Addiction is an affliction. A random road traffic accident sends him on the path to addiction. Crack is the only thing that can give him any relief from his living hell - but it's a far cry from the crack you might think it is. To ask other readers questions about CRACK, please sign up. As you are reading this story, you are following Joe as he struggles to come to terms with the accident. Unable to sleep and the images playing through his mind, most people would go and see a counsellor and talk through his issues , Joe has an usual way Joe O’Hara was a normal family guy. Working the night shift as a security guard, all he wanted to do was to provide for his family. That was until he was involved on a fatal accident with a biker, then all he wanted to was to feed his addiction. This is one of the most brutal and disturbing things I have ever read and I kept trying to run away from it. Several times I found myself scared to find out what was going to happen next. McCluskey’s combination of unpredictability and ominous foreshadowing creates a consuming tension and building dread. 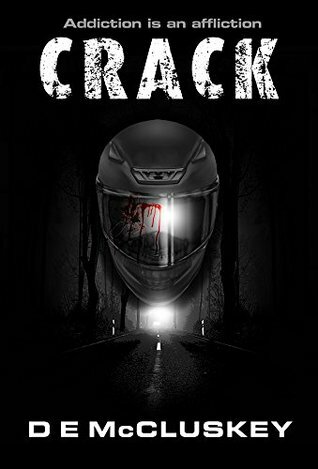 CRACK is listed as psychological horror, which it most certainly is, however, the brutality and graphic content pushes the envelope into the realm of extreme horror as well. Additionally, the edg This is one of the most brutal and disturbing things I have ever read and I kept trying to run away from it. Several times I found myself scared to find out what was going to happen next. McCluskey’s combination of unpredictability and ominous foreshadowing creates a consuming tension and building dread. CRACK is listed as psychological horror, which it most certainly is, however, the brutality and graphic content pushes the envelope into the realm of extreme horror as well. Additionally, the edgy element of realism makes this a truly frightening read for the intellectual horror connoisseur. This story has widespread appeal… except maybe to those with delicate constitutions. What can I say about this book. Firstly I should say I'm extremely desenitised, and this book, it's something else. It's gory, but not just gory for the sake of it, it progresses the story well, so that's my warning out of the way. I LOVED THIS BOOK!! so I'm not doing spoilers, that drive me insane, but I will say this, the author has the rare gift to be able to write well and also spin a good yarn, ( trust me they are two different skills ) The characters are so three dimensional and you feel l What can I say about this book. Firstly I should say I'm extremely desenitised, and this book, it's something else. It's gory, but not just gory for the sake of it, it progresses the story well, so that's my warning out of the way. I LOVED THIS BOOK!! so I'm not doing spoilers, that drive me insane, but I will say this, the author has the rare gift to be able to write well and also spin a good yarn, ( trust me they are two different skills ) The characters are so three dimensional and you feel like you really get to know them, and genuinely care what happens. Nothing is worse that a book where you couldn't care less about the characters. This was an amazing read. It had a bit of everything I like in a book. A bit of extreme with gore mixed with a dose of reality. The book follows the main character Joe and his life after being in a brutal car accident. Doctors and medications was not enough to help him cope. He seeks out ways of his own to ease his troubled mind, and it soon becomes a addiction that spirals quickly out of control. The more he gives into it the more he needs to get any peace. This book was a roller coaster and I felt This was an amazing read. It had a bit of everything I like in a book. This book was a roller coaster and I felt at times I was riding shotgun with Joe on his journey of madness. Great read and another you will find hard to put down. Fantastically written and such a out there concept. The way that one accident can change a mans life so much and such a different way to show addiction, not your normal drink or drugs. DE McCluskey is defiantly an up and coming writer to keep an eye out for. He will go far. Not usually my preferred book genre, but must say I genuinely really enjoyed this. Unexpected ending...couldn't decide if I was rooting for the main character to recover or couldn't stand him and wanted him to get his taste of karma. This is a brilliant dark and twisted story. It gripped from the start and is very well written with relatable, engaging characters and an original, imaginative plot. Its the first McCluskey book I've read but won't be the last. Very addictive as the name suggests! A great (and shocking!) plot that surprises all the way to the end.